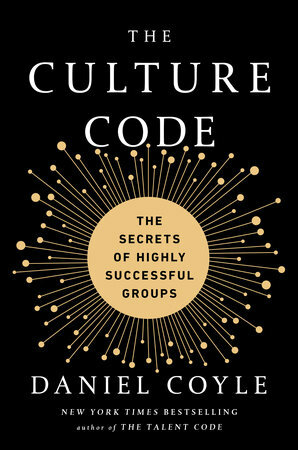 I recently finished my first book from the Next Big Idea Book Club - The Culture Code by Daniel Coyle. I had this book on my Amazon wish list before I joined the book club so I was excited to start reading. Coyle researched high performing groups to discover what makes their culture great. He came up with three components of excellent culture: build safety, share vulnerability, and establish purpose. In each section Coyle tells stories, share principals, offers detailed how tos and ends with ideas for action. In the building safety section, Coyle talks about the importance of belonging cues. When we feel that we belong, we feel safe. "Belonging cues are behaviors that create safe connections in groups." These cues are nonverbal body language things - eye contact, proximity and like. They aren't isolated events, the cues are given off constantly. A common misconception is that you have to trust some one before they can be vulnerable with you. Coyle debunks this and offers that vulnerability can lead to trust. Vulnerability loops are opportunities for group members to share weaknesses with each other. A leader can built a strong culture by being vulnerable enough to say "I screwed that up". Coyle believes it's the most important thing a leader can say. Crafting purpose is the final portion of Coyle's book. As a leader, you are responsible for helping group members understand what they are working for. Coyle cited a survey that said that only 2% of employees could name the top three priorities of their company. That was surprising to me. My favorite part of the book was the Ideas of Action chapters at the end of each section. I would review my highlights from the section and the action items offered and make a list of things I could do in my organizations to improve the culture. I really loved the benefits of being in the book club. There is a Facebook group to discuss ideas as we read and a Facebook live with the author. The book also came with a study guide. And there's a member's only section of the website with additional materials. I haven't had a chance to watch all the videos but I'm excited to see them and deeper my understanding of the concepts.